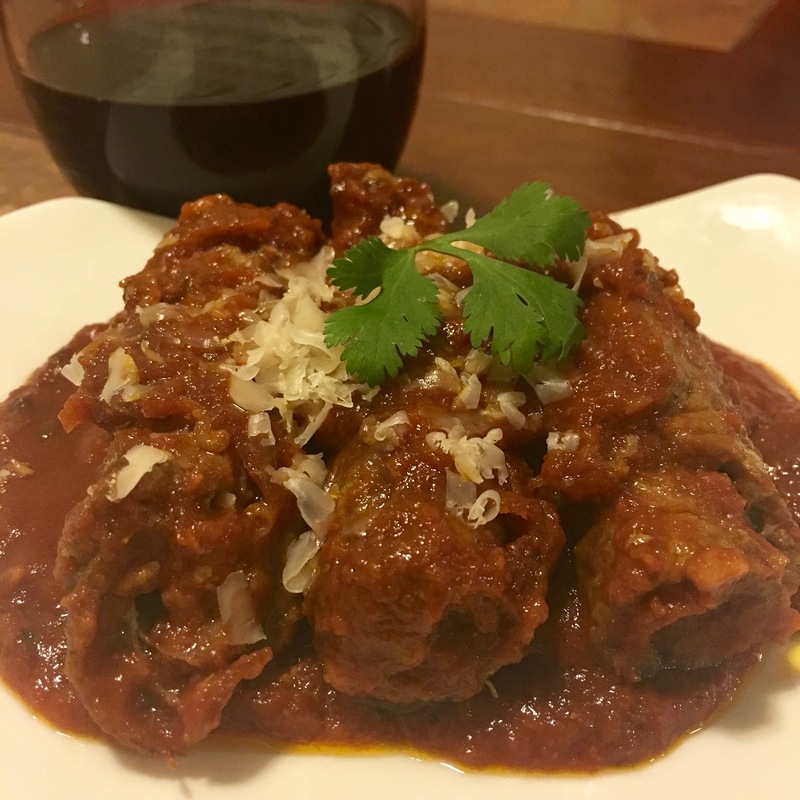 Have you ever had Braciole? Imagine prosciutto stuffed beef rolls that melt in your mouth slowly cooked in our favorite Sunday gravy (Grandma’s Spaghetti Sauce). 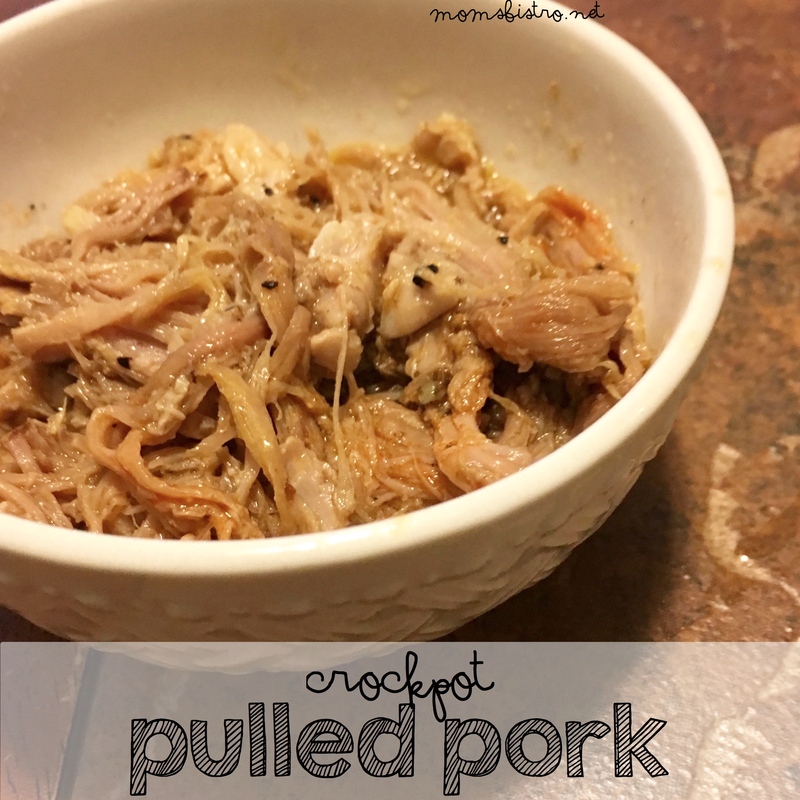 It really doesn’t get any better than this, and not to mention, it’s a pretty budget friendly recipe. 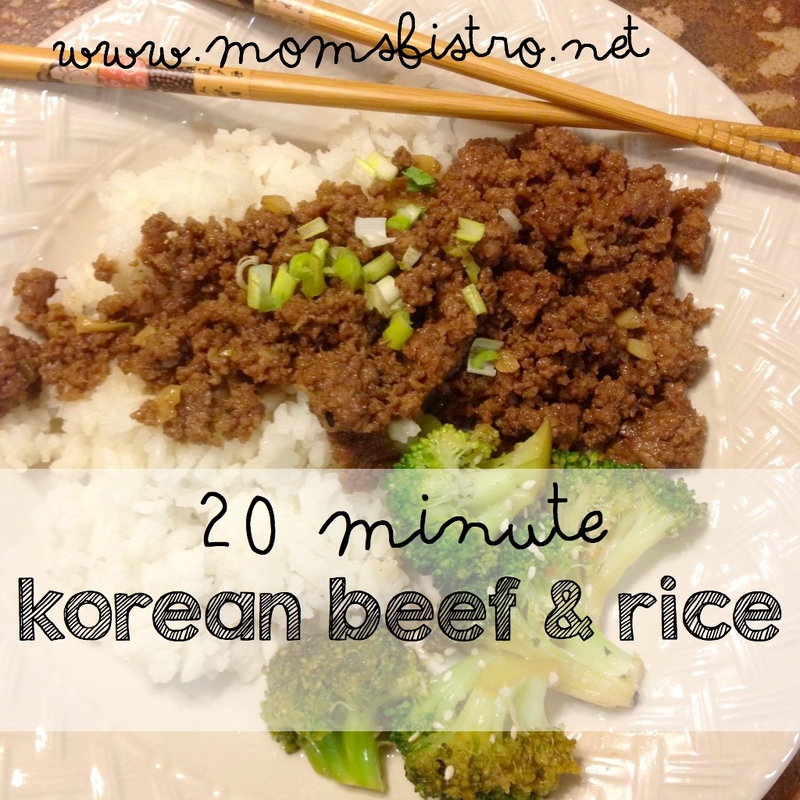 Especially if you’re looking for an affordable, but elegant dinner party meal. 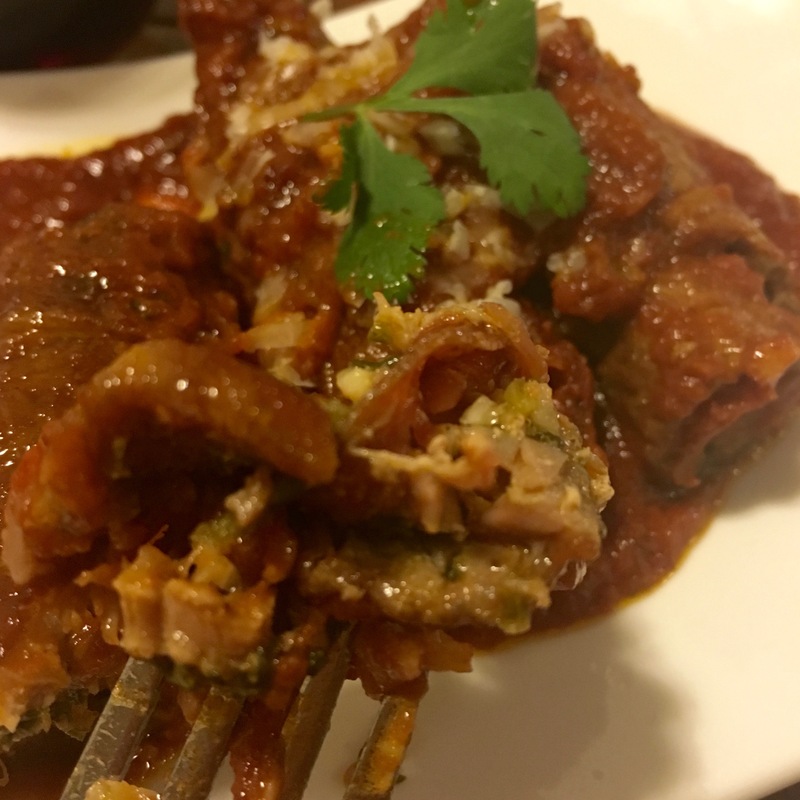 We had this braciole for our Christmas dinner. 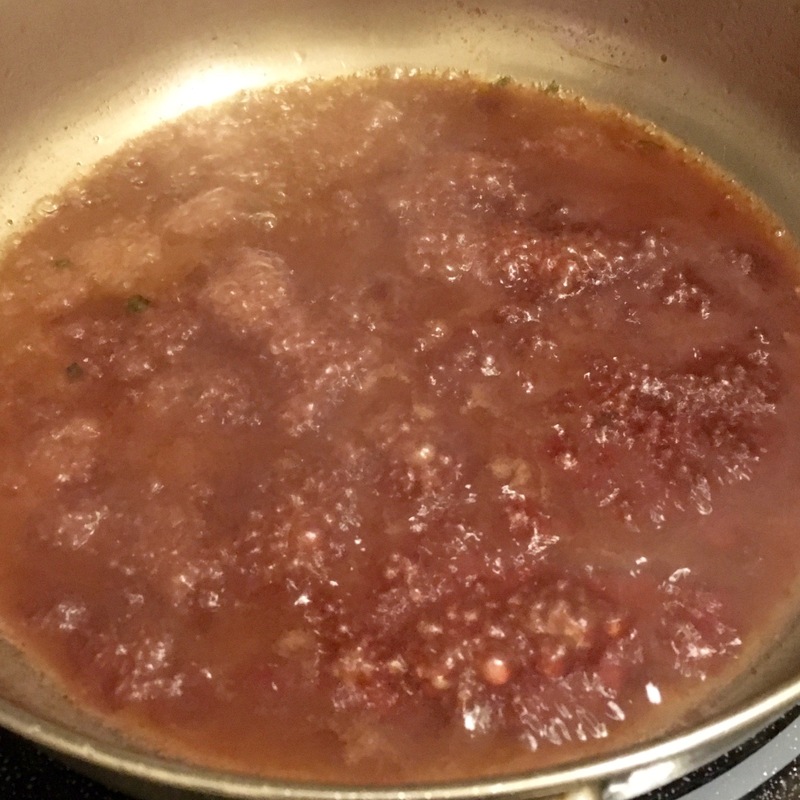 We didn’t want anything fancy since it’s just the three of us, so we decided that our go-to recipe for Spaghetti Sauce should be featured, and when D.J. said bricole, it was set in stone. 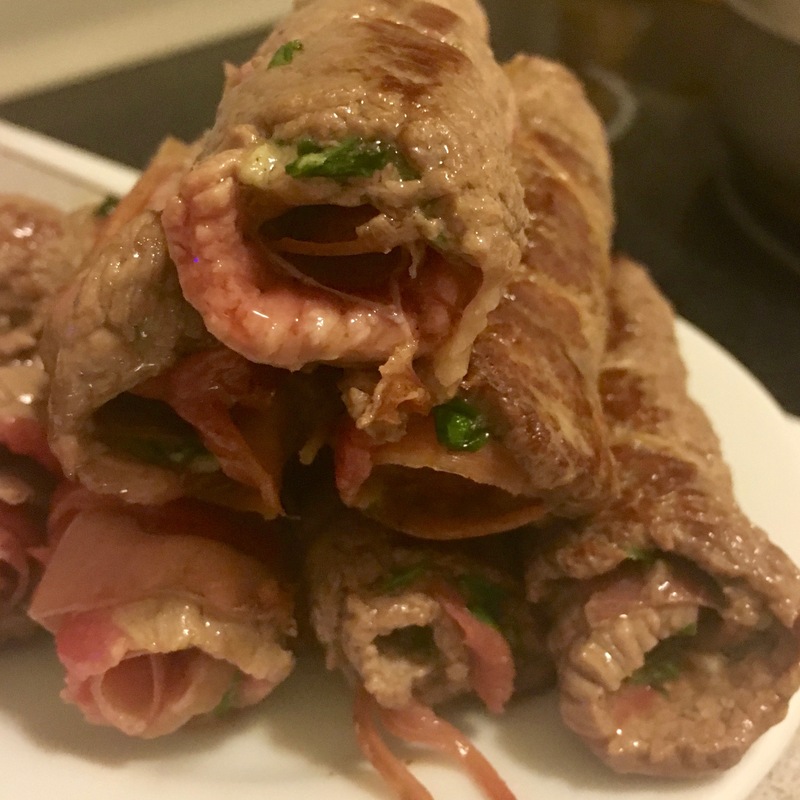 Braciole is a special treat, especially for D.J. As we were making the bricole together on Christmas morning, he told me stories about how his grandma used to make it, so of course we had to call her and tell her what was for dinner! Grandma’s recipes are always delicious. 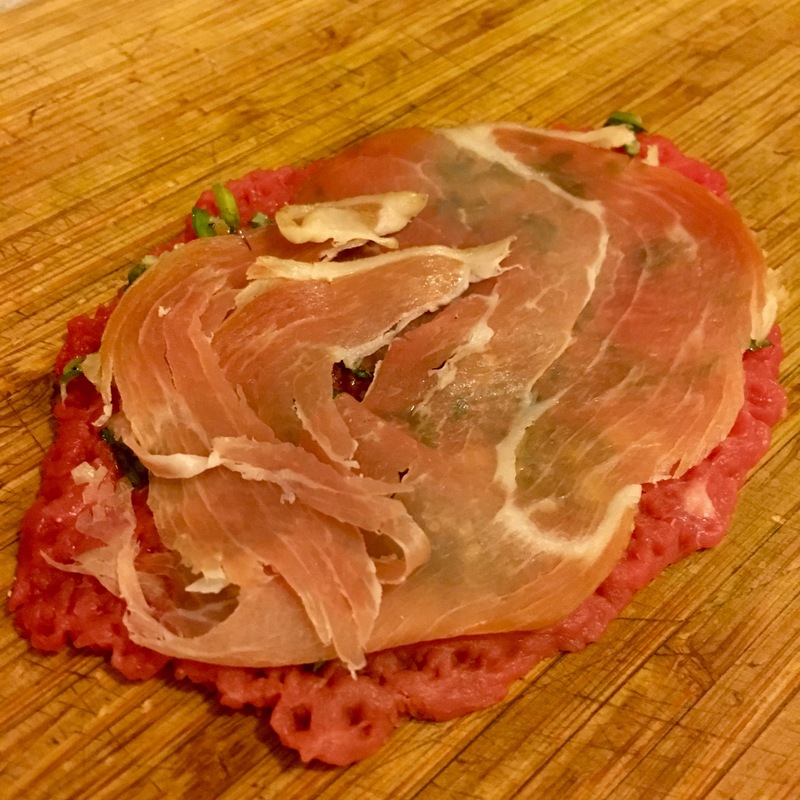 Braciole is steak pounded thin and then stuffed with a garlic and herb mixture, and best of all -prosciutto! If you’ve never had prosciutto before, do yourself a favor and go to your local grocery stored deli right now, and get some. Delic! In a small bowl, mix garlic, parmesan, parsley, salt and pepper. Set aside. Place beef in-between two pieces of plastic wrap and pound gently with a meat tenderizer or the bottom of a heavy pot or pan to a 1/4” – 1/8” thickness. 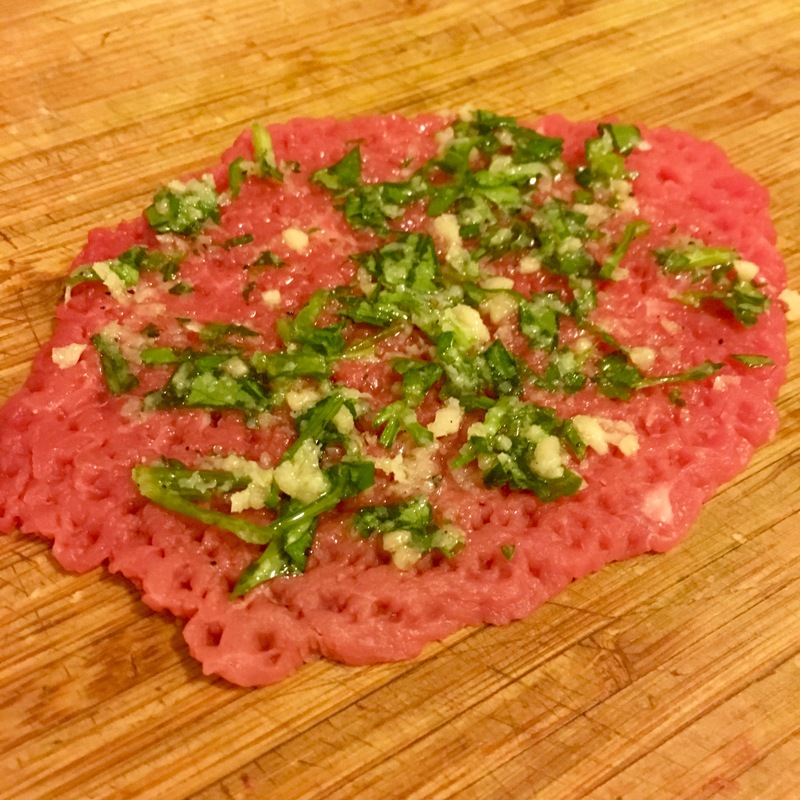 Sprinkle beef with garlic, parmesan and parsley mixture. 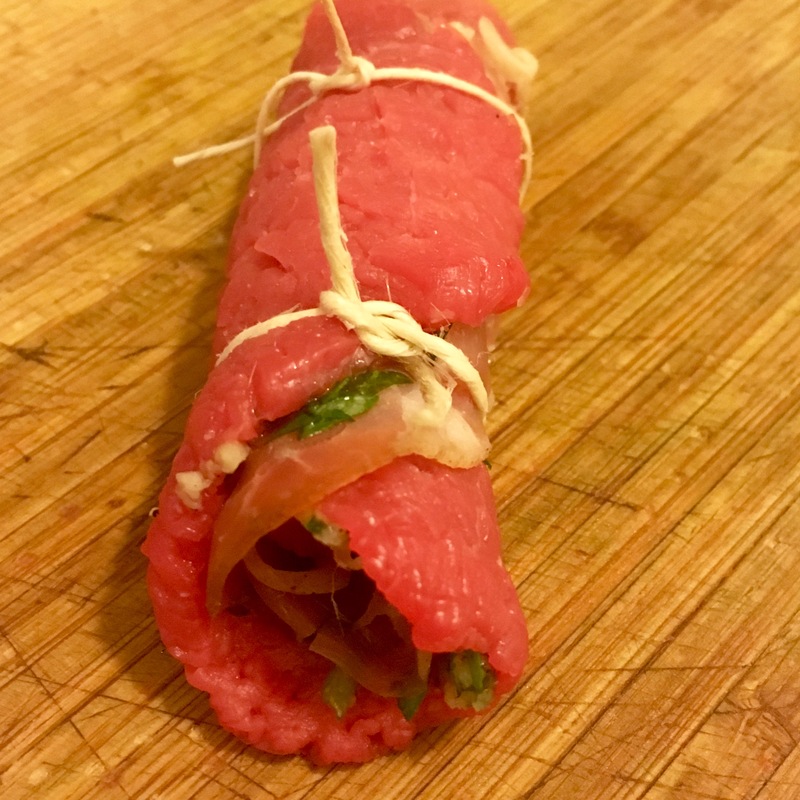 Roll each piece like a sausage and tie it with kitchen string. Heat oil in a large pan. 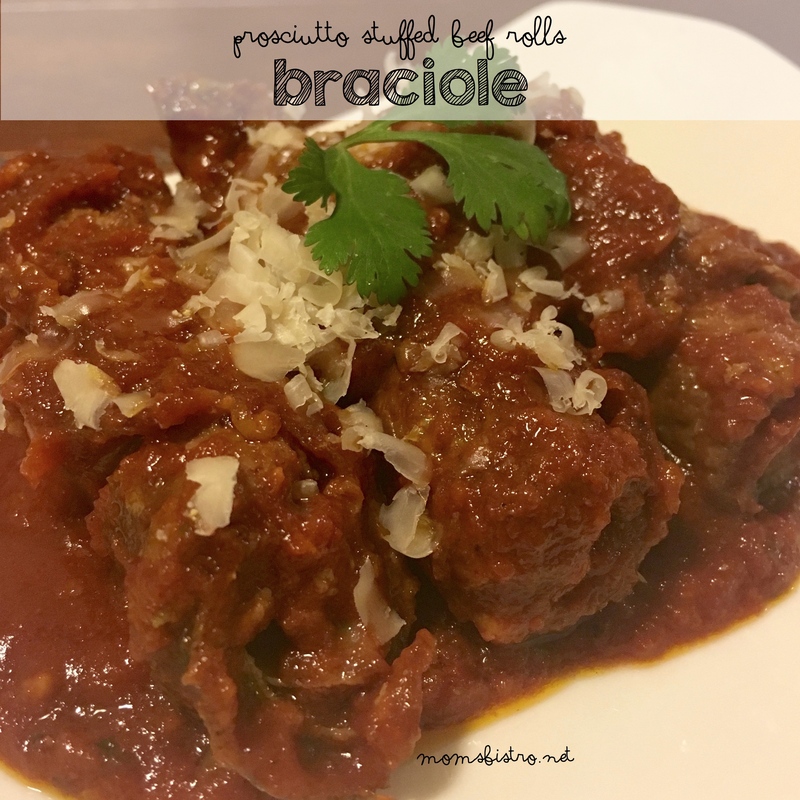 Add braciole. Cook, turning the meat occasionally, until browned on all sides. Carefully add wine, and use a wooden spoon to scrape up all the browned bits on the bottom. Bring to a boil, and then let simmer 2 minutes. 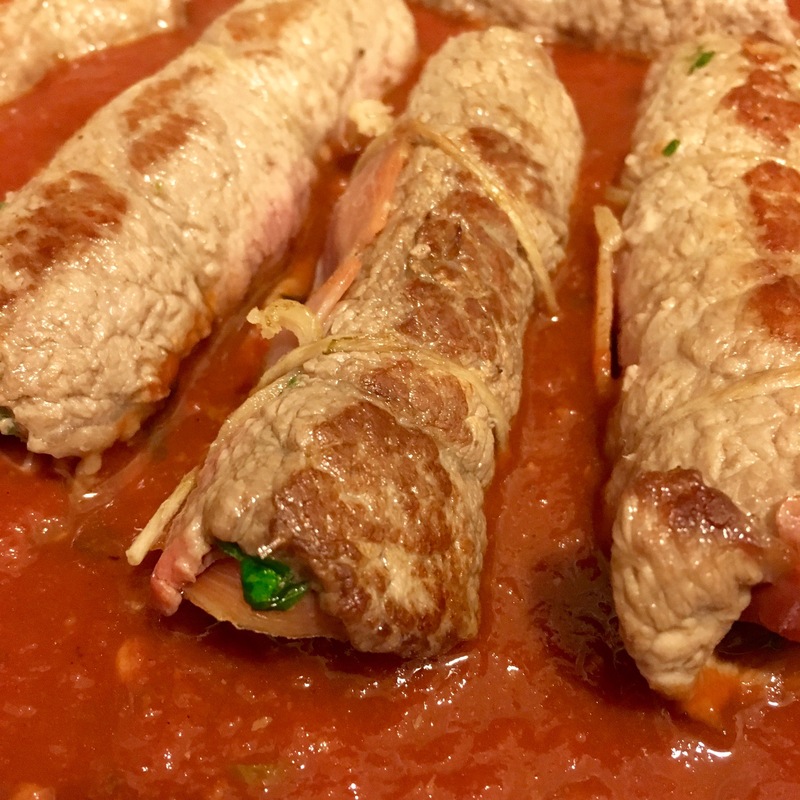 Stir in spaghetti sauce and put braciole rolls back in the pan. Cook and cover over low heat, turning the meat occasionally, until meat is tender when pierced with a fork – about 2 hours. Add a little water if the sauce becomes too thick.